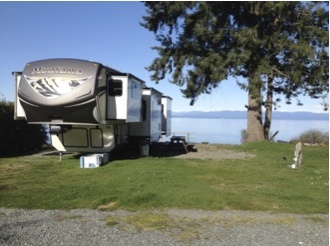 QCI Vacation Homes recently added a luxury 5th wheel RV for those who would like to get a little closer to nature. This 38 foot trailer has most of the comforts of home but can be located and set up in numerous locations on Haida Gwaii. 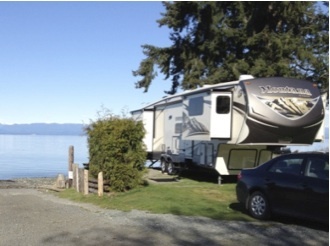 Although normally located at Hidden Island resort (link), a full service campsite on the outskirts of Masset, with prior arrangements the trailer can be pre-located at the campground of your choice. 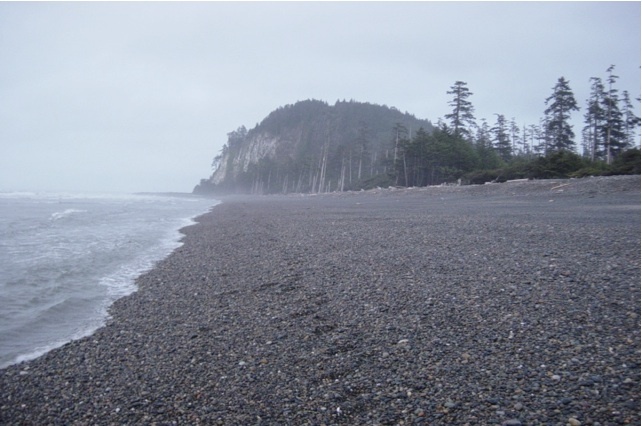 One of the most popular wilderness campgrounds in Haida Gwaii is just 30 minutes away from Masset at Agate Beach, located just before Tow Hill. 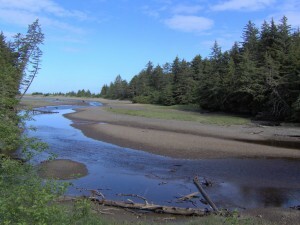 QCI Vacation Homes also has access to a private two acre lot on the Sangan River, about 15 minutes out of Masset. The Montana 3750 boasts five slide outs, a king size bed, two sofas that each convert to queen size beds, high definition TVs with Blue-Ray, stereo, microwave and large stand up shower stall. Most of the wilderness sites are un-serviced, so the trailer holds 66 gallons of fresh water with six heavy duty golf cart batteries and 60 pounds of propane. The trailer includes a small portable 1600 watt generator if wanting to use AC current or for recharging the batteries during extended vacations. There is a 17 foot awning off the front door which is much appreciated on those rainy days. It includes two reclining lawn chairs and a small, propane BBQ. This luxury trailer rents for $250/night or $1500/week plus GST (minimum four night stay). Monthly rates are available upon request. Please note that campground fees are the responsibility of the camper and are not included in the rental costs. There is a surcharge of $2.00/km to pre-locate the trailer at a campsite other than those at the north end of Graham Island. A 10% non-refundable deposit is required at the time of booking with the remainder due 30 days prior to arrival, which is only refundable if the booking can be replaced. A $500 damage deposit is required at the time of arrival. QCI Vacation Homes has sole access to a beautiful, 2 acre wilderness lot on the Sangan River Only 15 minutes east of Masset along North Beach the campsite is nestled amongst large, original growth Sitka Spruce, Hemlock and Cedar. It is located on the small peninsula of sand formed by the river and the beach. The campsite faces south and is extremely warm on those sunny days that bring cool northwest winds onto the beach. There are trout and Dolly Varden in the river for those wishing to fish and is home to a nice run of Coho that usually arrive sometime in September. Prior to the run commencing these salmon come in and out with the tiides for a couple weeks, and are excellent eating. Beach combing and hiking are right outside the front door and a canoe is available to explore the river should one desire. 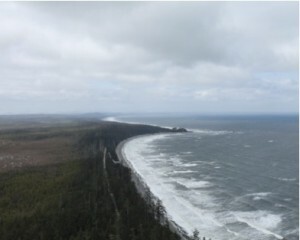 Agate Beach is located just before Tow Hill about 30 minutes east of Masset along the north beach. The road is half pavement and half well maintained gravel. This is arguably the premier campground on Haida Gwaii with many campsites right on the beach. 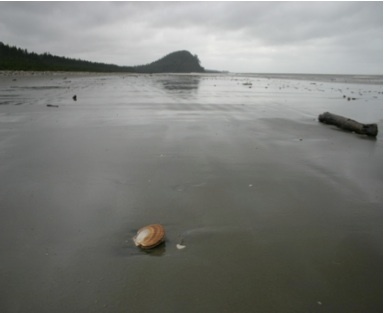 At low tide one can walk the beach and if lucky and one knows what they are looking for, agates can be found. It takes a bit of time to learn to recognize them but once accomplished, many can be found by walking any of the northern and eastern beaches of Graham Island. Numerous hiking opportunities exist that are easily accessible by foot from Agate Beach Campground. These include Tow Hill, Rose Spit and the Fife Trail which takes one to the East Beach of Graham Island. View from North Beach looking west to Tow Hill. QCI Vacation Homes gives you the rare opportunity to experience British Columbia’s northern island archipelago as a resident, in a fully equipped home.